This weekend, much of the eastern United States is enjoying a welcome relief from what has been a long and brutal winter. Temperatures are soaring well above average across the region making it feel like spring. In New York City, the high temperature in Central Park reached 54°F yesterday and it is expected to climb into the mid 50s again today. Last Sunday, the mercury only made it to 30°F. Our normal high for this time of year is 43°F. With feet of snow on the ground, these mild conditions have caused rapid melting throughout the area. Although this has caused ice to fall from tall buildings and some localized flooding, many winter-weary New Yorkers are enjoying this early spring preview. This warmer weather can be easy to acclimate to, but it is still February and winter is not letting go just yet. Cold conditions, including another arctic outbreak, are expected to return over the next few days. 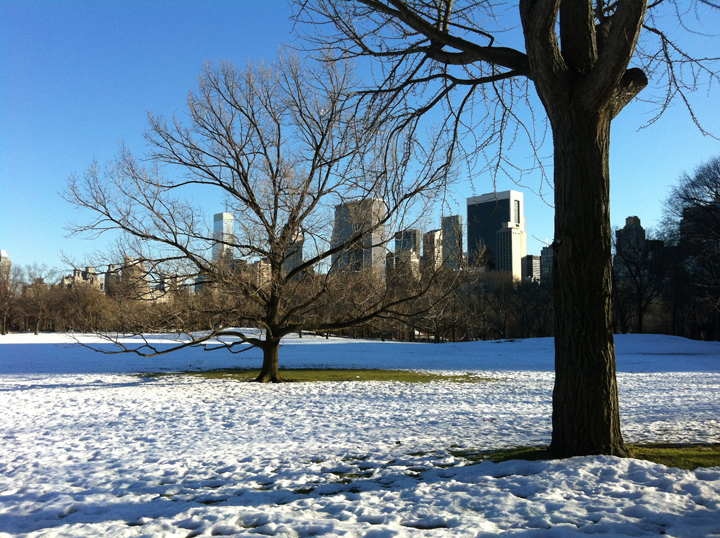 The first patches of green lawn seen in weeks on the Sheep’s Meadow of Central Park are revealed as temperatures warm and snow melts. Image Credit: The Weather Gamut.